Moon Phase (Lunar phase) refers to the appearance of the illuminated portion of the Moon as seen by us. The Moon phases vary cyclically as the Moon orbits the Earth, according to the changing geometry of the Earth, Moon, and Sun. The time between successive occurrences of the same phase (e.g. full moon) is about 29.53 days (29 days, 12 hours, 44 minutes) on average. 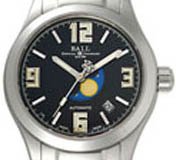 Because this time is not an constant, making the moon phase shown on an mechanical watch to be accurate is impossible. Therefore, adjustment is required. Change to the North or the South Hemisphere by clicking the circle next to the current time. The Moon-Phase Watch I like the most is the Ball Watch Moon Phase. I like this watch is not because of its movement or performance, I like it because of its' "Bright Moon" in the dark.